Stan Lee, in my mind, has to be one of the all time most recognizable individuals in the "Comic Book Industry". Most lovers of comic books have known his name all their collecting lives. For those of you who don't know his name, I am sure you have heard of his creations. The X-Men, the Fantastic Four, the Incredible Hulk, Daredevil, and the very well known Spider-Man are all from the mind of Stan-Lee. For the last forty years or more and as an employee of Marvel Comics, he has entertained us through the art of comic book imagination. He has also been a white knight of sorts to the comic book industry and has probably been one of the most influential single individuals the industry has ever seen. Stan was born in a backwoods Illinois cabin, oops, wrong human icon. Actually, he was born Stanley Martin Lieber on December 28, 1922. In later years he became an American writer and editor and was especially known for his collaboration with Jack Kirby and Steve Ditko. These partnerships developed some of the most complex superhero entities known in the comic book industry. His success helped change Marvel Comics from a small publishing house to a large multimedia corporation. In his teens, Lee began working as a copyboy for publisher Martin Goodman at Timely Comics, which would later become Marvel Comics. It was here that his first published work was released. It was a text-filler page and he used the pen name of "Stan Lee". It appeared in a Captain America comic book in 1941. He soon graduated from writing filler to actual comics, becoming the youngest editor in the field at age 17. After a stint in the army during World War II, Lee returned to what would later become Marvel Comics (a name Lee claims to have chosen). Remaining at Timely/Marvel throughout the 1950s, Lee wrote comics in various genres, such as romance, westerns and light science fiction. By the end of the decade, he had become dissatisfied with his career and considered quitting the field. But after DC Comics revived the superhero in the late 1950s and became very successful with the Justice League of America, Lee's publisher assigned him to create a new superhero team. Not having a real fear of getting fired Stan-Lee experimented with stories he preferred and suddenly his career changed completely. Lee gave the superhero a flawed humanity, a change from the ideal superheroes that were typically written for pre-teens. His heroes had bad tempers, melancholy fits, vanity, greed, etc. They bickered amongst themselves, worried about paying their bills and impressing girlfriends, and even were sometimes physically ill. Before him, superheroes were idealistically perfect people with no problems: Superman was so powerful that nobody could harm him, and Batman was a millionaire in his secret identity. Lee's superheroes captured the imagination of teens and young adults who were part of the population spike known as the post World War II baby boom, and sales soared. And so as the years went by, Stan Lee's contributions and prominence in the comic book field grew immensely. And here is more rather interesting information on Stan Lee. You will need to check this out. To find a plethera of Stan Lee items at Amazon, just click the image to the left. And as new developments continue in the comic book industry, I am sure Stan will be part of them. To keep up with interesting stories that I find, you can sign up for my free ezine "Comics Galore" and I have thrown in a great 5-day course on comic book collecting to boot. Just enter your name and email address below and start receiving the course immediately. Your name and address will only be used for comic book activity. I won't let any others use this list at all. 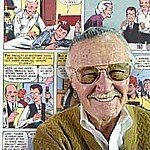 For more, just click on over to my next page on Stan Lee.